With permeable block paving you reduce the risk of of local flooding, rain water has to go somewhere, and even if you are not flooded, it might be affecting your neighbours’ downhill. Where you are reducing garden space, the use of a permeable paving material is an ideal way to deal with water drainage. Another advantage is preventing subsidence. 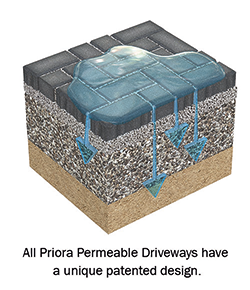 Non-permeable paving reduces or stops rainfall getting into the ground. This can cause the soil to shrink, especially if it is predominantly clay. Garden walls, paths and houses may develop severe cracks due to soil shrinkage. Permeable block paving allows for the water to drain through the blocks, allowing the water to disperse naturally. Virtually indistinguishable from its non-permeable equivalent, the use of permeable concrete block paving reduces the amount of run-off surface water by allowing it to drain through the base into the sub-base. Permeable paving is used like for like with concrete block paving, easing pressure on near-capacity drainage infrastructure.